Clear Lake City officials say they hope the project will serve as an example of how communities can take matters into their own hands as they await the completion of large-scale flood control projects. HOUSTON — In 50 years living in Clear Lake City, Spyros Varsos had never seen the floodwater get so high. During a historic rainstorm two years ago, he watched anxiously as it quickly accumulated in the street outside his three-bedroom home. So this summer when even heavier rains drenched the greater Houston area in the wake of Hurricane Harvey, he was even more fearful. But his home didn’t flood. For that, he credits some precautions he took of his own, like clearing debris from the drains on his street. What he said made an even bigger difference, though, was a nearby flood control project that wasn't even completed yet. A few blocks away from Varsos' house, the Clear Lake City Water Authority has embarked on a $28 million project to retrofit a shuttered golf course with five detention ponds that will be able to hold half a billion gallons of stormwater. Only one of the ponds was near completion when Harvey hit. Still, it prevented about 100 million gallons of water from pouring into the drainage system. John Branch, the water authority's board president, estimates the pond — only 80 percent excavated at the time — saved 150 area houses from flooding during the historic downpour. When it's complete in 2021, the nature park, called Exploration Green, will have miles of hike and bike trails and acres of wetlands. The nonprofit conservancy will manage the park, and the water authority will maintain the detention ponds, Branch said. Older areas of Houston like Clear Lake City — a master-planned community built more than half a century ago — sprung up at a time when developers were not required to offset the impacts of their development on flooding problems through measures like detention ponds, Branch said. Experts say detention-pond infrastructure is vital in older, flood-prone parts of the city and has helped reduce flooding damage in some areas where it was implemented as part of the development. "One of the best hopes [to prevent local flooding] is to add in green space and detention ponds wherever we can in these areas — what I call legacy flood-problem areas — that were built early on," said Phil Bedient, a Rice University engineering professor who studies surface water hydrology. Bedient said detention ponds are a relatively newer feature in Houston; They weren’t common in the city until the mid-1980s, when Harris County began requiring developers incorporate them into building projects. 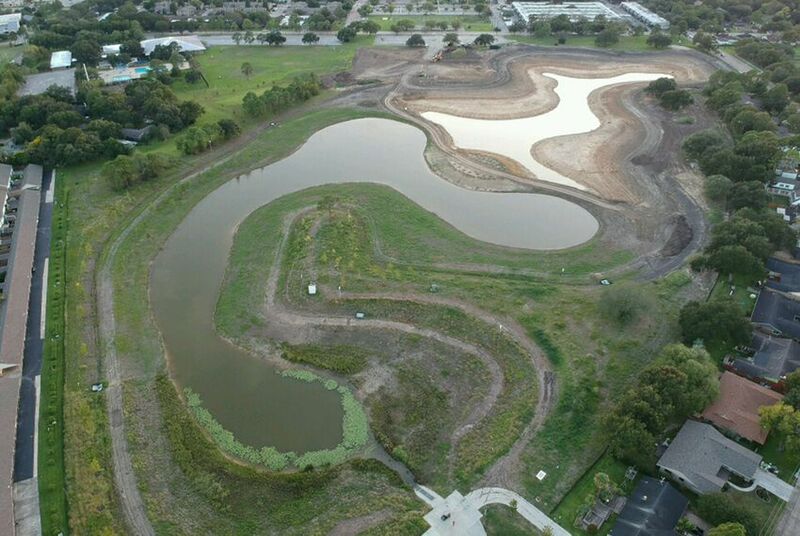 While detention ponds won’t prevent all localized flooding, Bedient said they are a necessary complement to larger-scale projects underway throughout the Houston area such a bayou widening and increasing the capacity of drainage infrastructure. Alan Black, the Harris County Flood Control District’s director of engineering, said the county is always looking for locations to add water detention infrastructure. The district, in partnership with the city of Houston, is pursuing a project similar to the one in Clear Lake City that will outfit a 227-acre golf course in a well-established northwest Houston neighborhood with 10 detention ponds. Recreation areas are expected to be incorporated into the ongoing project, which is estimated to cost more than $30 million, including the cost to purchase the property. Black called the project “unique” and “extraordinary” because of the amount of added detention space it will provide in a developed neighborhood. Defunct golf courses can be useful locations for flood control projects because of how much contiguous land they can take up in the middle of neighborhoods, Black said. (They also appear to be increasingly available for purchases as their popularity declines). But they are not the only option — unused parking lots or industrial sand pits can be ideal sites for flood control projects, too, as long as they are near water channels, he said. Bedient said buying out flood-prone homes — something both the city and county are pursuing with fervor post-Harvey — also can create absorbent green space. A big barrier to the success of such programs is how expensive they are. The high cost of buying land in developed areas for flood control projects is often a limiting factor, said Black. “As you get more and more urbanized, it’s harder and harder to find what I’ll say [is] ‘cost effective’ property that you can then build a detention basin,” Black said. But Branch, the Clear Lake City water authority official, says their project is worth the expense. When Exploration Green is completed in about four years, he estimates that up to 3,000 homes will no longer be in either the 100- or 500-year floodplain — areas with a 1 percent or 0.2 percent chance of flooding in any given year. It also will be a huge boon to quality of life in the area. The almost 200-acre spread will house bird habitat islands, athletic fields, native grasses, thousands of trees and recreation trails. "It's certainly important for drainage, but it's important for kids growing up here to have a place just to do stuff that kids do," said Doug Peterson, the vice chairman of the Exploration Green Conservancy. Despite the huge difference he thinks the project will make, Branch concedes there is no silver bullet to flood problems. Detention ponds are only a small, if but important, part of it, he said. Still, he said the time is now for communities to take flood control into their own hands. “Look for short-term solutions and long-term solutions," he said. "And take advantage of opportunities as quickly as you can."